I have been slacking on the entries this month. Not for lack of interest or not having any thoughts to share but every time I sat down to articulate them I just couldn’t. But here I am- on a plane with several hours to go. I might as well use this time to collect my thoughts. Right now I am en route to beautiful San Jose, California for a real, much needed, vacation. I will be visiting my brother and hoping so see some of the friendly faces that make up his adopted “west coast family”. I already told Adam that since my appetite is in working order that an In N’ Out Burger (animal style of course) was a necessity. I opted for the cheapest flight through Southwest and was blown away by the affordability. To no one’s surprise that means flying from Providence to Baltimore to San Diego THEN San Jose. Despite a long day of flying I have been fortunate to be seated next to some lovely people (and avoid the Detroit airport for once). As I lined up to board my first flight, distracted by matching up ‘B17’ with the appropriate place in line, I hear a familar voice in front of me say “oh hi!”. It was Erin, a resident at Women and Infants. If anyone is new to the blog or needs a refresher, Erin was the doctor that was responsible for inserting an NG tube into me during the first intestinal obstruction. It was traumatizing for all parties involved. She felt so badly about it that she visited me in the hospital after her shift every single day. In fact, she always seems to find me when I am inpatient which brings a smile to my (often delirious) face. In short, a surprise catch-up with Erin on our way to Baltimore was beyond exciting. With the exception of a surprise plane ride alongside Erin, I am free of the hospital for this week. My oncologist kindly granted me a week off to travel. Actually, Dr. Robison mandated that since I am in California I must eat a burrito, like a good one. Welp, doctor’s orders. A week off from treatment couldn’t have come at a better time. The time I would have spent this morning getting blood drawn and rushing to work was spent entirely in bed easing into the day. Bliss. Over the past few weeks I have gone through periods of feeling a little deflated. I recently had a discussion with my oncologist about expectations. Dr. Robison can see that I am disappointed that there is no established “end date” for when the taxol (chemo part) might end. We had a healthy discussion about, based on what we know, what this means for my immediate and long-term future. From a clinical perspective, the goal is treat to prevent new tumors. From a patient perspective, my perfect-world scenario would be to treat to prevent new tumors and get rid of the ones I already have lurking around my abdominal cavity. I constantly toggle between feeling wildly optimistic that I can achieve a cancer free life (someday) and settling with the fact that the cancer may never entirely leave me but with treatment/maintenance I could still live with a pretty good quality of life. After I left treatment last week I was frustrated, I didn’t want to be made to reconsider my expectations. After a week of sulking, crying, writing and rewriting I think the only conclusion that I can draw is that it is important that I recognize that this process is going to continue to be long term. It is important that I dig deep and accept that if these tumors are going to be freeloaders and live inside of me for the long haul but aren’t growing, I am still winning. Most critically, it is essential that in accepting these realities I still allow myself to believe in a world where I no longer have cancer. No one knows the outcome of this story. Establishing realistic expectations and dreaming do not necessarily negate one another. So I choose to accept and believe simultaneously to the best of my ability. I am currently sitting next to a woman on the second leg of this journey (Baltimore –> San Diego). It feels like a chance encounter where we just happened to be in the right place at the right time. This woman noticed that I was drafting a blog entry and asked: “are you a blogger?” from there we discussed blogging, writing, etc. Naturally it came out that I write about living with cancer to which she responded: “I am a cancer survivor too, breast.” Her name is Billie and she is a minister. She is returning from a trip visiting her grandchildren in Virginia. She has overcome many devastating tragedies in her life, yet maintains such honest and positive perspective. We spoke a lot about our common thread, cancer. Treatments, surgeries, being bald, confronting changes in the body, menopause, relationships evolving and dissipating. We also chatted about books, goals, and bucket lists. Billie is the type of person that has a lot to say, but no words are wasteful. She opened herself up to me in a way that was not imposing and I found her to be most insightful. She is a walking, talking, breathing reminder to keep living and finding comfort and joy in the simple pleasures. Thank you Southwest, you’ve nailed this trip thus far. Speaking of thank-you’s I would like to thank everyone that has donated to the 2015 National Ovarian Cancer Coalition Walk to Break the Silence. On Sunday, September 27th I will be joining the Rhode Island chapter of the NOCC for their annual walk. I created my fundraising page just two or three days ago and already donations are pouring in! I am in awe of your generosity and support. I would also like to thank Miss Stacey Applesauce Goldman and Emily Nason for registering as team members. In speaking with other friends, it sounds like we are going to have a solid posse on the day of! If you would like to join this team, Teal All Your Friends, you can do so through my donation page in the top right corner. 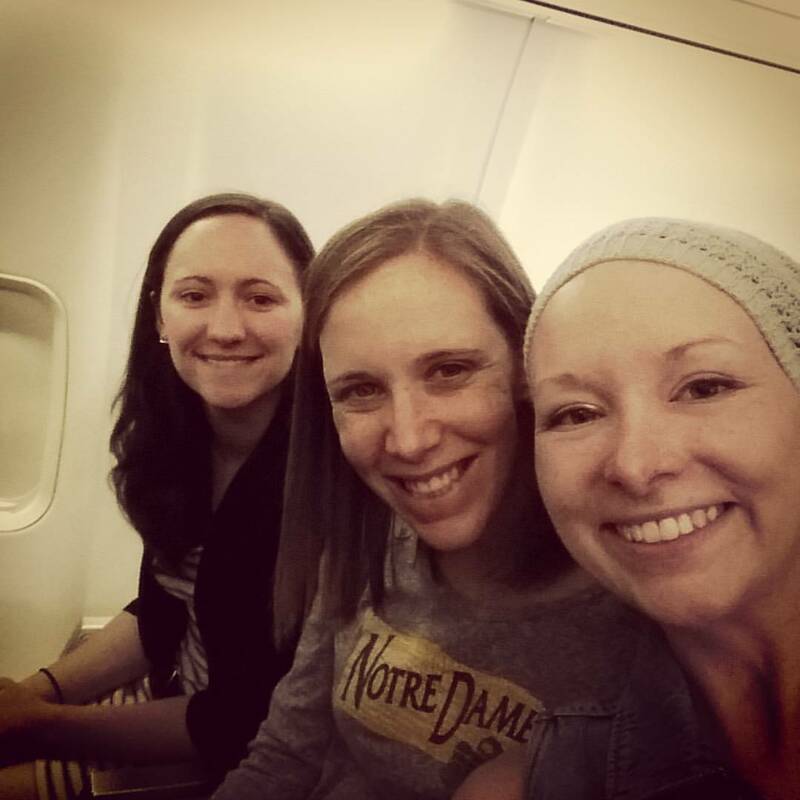 Have a wonderful vacation Jess – love hearing about your traveling seatmate friends – what a joy when that happens! Your writings on expectations are full of wisdom, clarity, struggle and hope…thanks for writing – enjoy the burrito! Thank you Deborah! I really appreciate that feedback. I am very lucky to have the opportunity for such travels! No Jessica…… You are the one who is AWESOME! ! Have a great much deserved vacation . You are already off to a good start! Hi Beth! I definitely was sure to send my love from everyone back east. Thank you for always sending your love and support to our family. I hope you are doing well!